Charming family home. 2 bedrooms, 1.5 bathroom home, recently fully renovated with brand new kitchen, new bathroom, new flooring etc. All ready for you to enjoy Ottawa, and all the amazing activities and festivals the city has on offer. Parking for 2 cars in driveway, one behind the other. Please note that driveway is shared iwth neighbour on the left (as you face the house) ... so please keep cars to the RIGHT hand side of the driveway. Backyard interlock patio with charming outdoor furniture, BBQ and deck with sliding patio doors take you outside for the kids to play or to simply relax on the deck with a cup of coffee. One king size bed in the main bedroom and a queen in the guest room. Laundry facilities upstairs. Linens stored in upstairs hall closet. House is perfectly set up and kitchen is fully equipped. New kitchen with gas stove !! House is fully equipped with everything you need for a nice winter or summer break. Wifi, cable TV, newly renovated and nicely furnished. Property Manager is available to welcome you or to answer any questions. Easy access to the house with a lock box on the door. I grew up in Ottawa not far from this house. I went to high school in Ottawa and University in London, Ontario. We are house proud and enjoy decorating, renovating and gardening. 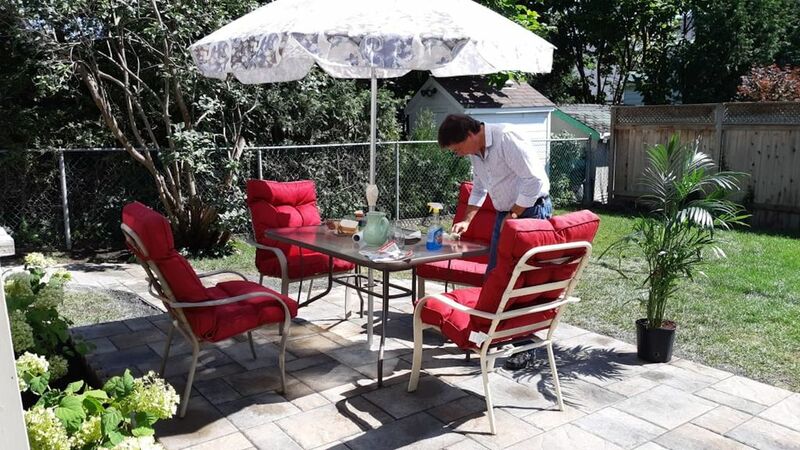 This summer worked on making the backyard a real oasis with lots of plants and seating areas. We love travelling, camping, beach life and cottaging. We spend a few months every winter somewhere warm and sunny... and so the house is available for long periods of time. This is a great deal!! You get a WHOLE house all to yourself, with a wonderful brand new kitchen (gas stove!!) 2 bedrooms (one has a king sized bed), 1.5 bathrooms, laundry upstairs, and a full living room, dining room and study on the main floor. And a CHARMING back yard oasis... Just compare it to hotel prices in Ottawa. Plus parking! Here you have a lovely family home in a nice neighbourhood, with a backyard, deck, interlock patio and a BBQ. This house is in a nice family neighbourhood with room to spread out. 10 minutes by car to downtown Ottawa (or 20 minutes by footpath along the Rideau River, through Stanley Park).. this house is great!! You can't beat the location.. a few minutes walk brings you to the Governnor General's residence, the Prime Minister's home at 24 Sussex, the famous Byward Market, Stanley Park and the river walks. A really lovely location. driveway. Please keep close to the house, as the driveway has a small strip along the left that belongs to teh neighboru. So long as you park close to the house, you will be fine. Garbage bins and recycling bins are at the back of the house. Garbage day is early Monday morning. It alternates so please check City of Ottawa website for information as to what is being collected. yup! Heather - g5 is the network. Ask me for the password. Information is included in the Notes .. which you receive upon booking. Coffee percolator. Works just the same. Coffee by spoonful into top of percolator. 6 spoons for 6 cups of coffee etc. Makes delicious coffee. Please feel free to use whatever we or the last guest has left in the pantry. Dry goods. Kitchen is well equipped. You should find everythign there Coffee percolator, toaster, blender, microwave, pots and pans etc. Wonderful brand new kitchen with quartz and butcher block counter tops. Please use mats on the butcher block. There are two stools for easy breakfasts. Stove is gas on top and electric fo oven. Rogers cable. Good selection of channels. Absolutely charming, very well located to all tourist attractions. Upon our arrival there was a lovely bottle of wine with 4 glasses. There was everything and more than I have ever seen in any other VRBO. Lots of condiments, fully equipped with all cooking tools etc. Thank you so much for your kind words. Pls come again :). We are so glad you enjoyed your visit to Ottaws and our home. Had a great time place is in great shape. Be warned there is only space for ONE car in the driveway due to the neighbor. Parking on the street during the day will land you a $40 ticket, (3-hour max rule in Ottawa). Second, the air conditioning on the second floor is very weak as previously stated. Downstairs freezes while upstairs boils. Forced air needs a stronger blower to get the cold air up and/or closable vents for lower floor to force the cold air up. I am confused about the parking issue. The driveway is 50 feer long. We often park 2 cars in the driveway. One behind the other. As to air cond yes we have closed off some venrs and upstairs is cooler now. Thanks for the tip. The house is small but well renovatied. There’s very little parking spot, my daughter had to park on the street, but it was fine didn’t have any issues. The upstairs bedrooms were very very hot to sleep in, we had to go and buy some fans, the air conditioning doesn’t reach up there. House still needs a bit of renovations and I believe they are attempting that later. Overall, I don’t think we’ll be staying here again. Thanks for your review Linda. It is true there is no hair dryer. Sorry never thought of that. But parking confuses me. The driveway is very long and has parking for 2 cars or possibly 3 if small cars. There is plenty of driveway parking or as you indicated if three cars you can park in front of the house. Thanks for your comments. It is always helpful. We (older couple) spent 2 weeks in this house in May 2018 - the property was very clean and the large king size bed very comfortable (very important for a tall couple). The property is convenient to local shops and eating places in Beechwood and a 1.5km walk will get you to the city centre. Gatineau Park is 15 mins away and riverside walking trails are easily accessible. While the owners were away, the property manager was responsive to our needs (mostly a couple of Aussies not able to operate the heating!). The kitchen was adequate for the cooking that we wanted to do, dining and lounge areas are very comfortable for local guests (or in our case family) to visit. Thanks Fred and Sue. Glad you enjoyed the house and your stay in Ottawa and looking forward to having you visit again. Thanks for kind words!! Why would anyone want to stay in a cramped hotel room that cost 2-3 times as much compared to this real home away from home that Heather has offered to all of us. I like lots of room to roam and this place has it. Close to shopping, museums and the country's parliament grounds, short trip to Quebec for real poutine, lots of movie theaters. Ottawa is really a beautiful city all year round but especially in the summer time. Thanks Heather and Antonio for this spacious and affordable alternative to a hotel to stay for our trip. Thank you so much... what a lovely review. And I can't agree with you more about Ottawa being a great city. Hope you come again. All the best and thank you again for being our guest.